Hungry Kat: Simple but Delicious Meal in 5 Minutes! This is my revised 5-minute version of the Croque Monsieur/Madame. 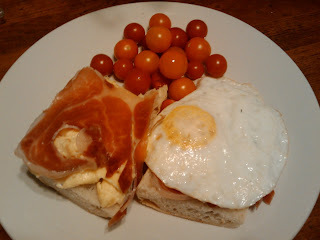 Well, okay, it's really a "fancy" ham and egg sandwich. But it's healthy, quick, easy and great as breakfast, lunch or dinner. Slice a piece of fresh baguette in half and put two slices of Jamon Serrano or prosciutto on the baguette. I like going to Surfas for these two items because they sell fresh French baguettes and their jamon and prosciutto selection is great; plus I live close to by. Scrambled. Overeasy. Sunny side up. Poached. Hardboiled. I love eggs and I can have them any time of the day. Here, I cooked one egg overeasy and I slow-scrambled the other one. I highly recommend slow scrambling your eggs because the eggs will come out moist and "eggy" without the need to add butter or milk. Just add a little oil to your pan and heat it up. As soon as you pour your eggs in, turn the fire real low - as low as possible. Keep stirring with a wooden spoon or a spatula that won't melt until the eggs looks solid. Put warms eggs on top of your jamon so the eggs will melt the meat's fat. Add cheese in between if you wish. I had cherry tomatoes from my Farmers Market run so I added that to my meal for a balanced meal. I'm a big fan of Farmers Markets. If you have one near you, stock up on whatever is in season; it'll give variety to your meals and help you get creative. I'm in sunny Los Angeles so I'm up to my ears in tomatoes right now and I'm using them as snacks, side dishes, and fresh pasta sauce. Get organic, free-range eggs from the farmers too. They are worth the splurge for that creamy orange egg yolk; your egg will actually taste like an egg.